Two weeks ago I told you how to make tiny meatballs and freeze them. Now here are 10 easy things you can do with them. Add them to spaghetti. This is obvious, but so what…it’s a classic! Put them on top of pizza. Tiny meatballs are especially good on pizza, since the big ones are just too big. You can even cut them in half and make them like meatball mounds. Add them to soups. Any kind of soup! When we were first married and my in-laws were young enough to cook and try to impress me, they added tiny meatballs to their turkey noodle soup with ring noodles and sprinkled it with Romano cheese, and my kids will tell you that it was one of their happiest food memories from LeRoy, NY. There was always a hot bowl of soup waiting for us when we got there. In fact, now that I think about it, when we were in Italy visiting family many, many years ago, Marissa served us a soup of chicken broth, tiny meatballs, and homemade crêpes…yum. There might have been cheese in it, too. 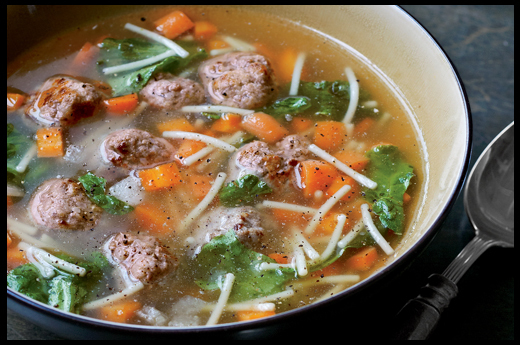 Make Italian wedding soup*. This will be a future recipe only because the tiny meatballs are already made and it’s Eve’s favorite soup, so I must learn how to make it. Make “Abruzzi Spanish Rice.”* Another Cinquino classic, which is basically a rice casserole with tiny meatballs, crushed tomatoes, and mozzarella cheese. Again, recipe to come. Add them to lasagna or ziti. Why not? Put them on a stick and serve them as an appetizer. You can make a spicy dipping sauce or not. Put them in a sandwich. A tiny meatball sandwich! Take a roll, heat the meatballs, add some sauce, top with some cheese, and voilà. If you are feeling really ambitious, heat up the whole thing, even the roll. Make them part of an antipasto salad or platter. After all, they are good cold, too. Just make sure they are thawed. Serve them in sauce with bread and butter. One of my favorite neighborhood restaurants in New York is Co. pizza on 24th Street and 9th Avenue. They have an appetizer of meatballs in sauce that comes with a hunk of awesome bread and good butter. It reminds me that one of my all-time flavors is good bread with lots of butter and tomato sauce on top. The meatballs are just a bonus! Maria, my family is also from the Abruzzi region (and western NY). The crepes you are referring to are called Crispelle (Scrapelle in our dialect). They are very eggy crepes, filled sparingly with Pecorino Romano cheese and black pepper, then tightly rolled up and served in chicken soup. The crepes taste like a delicate egg noodle. This is one of my favorite dishes — almost as good as stuffed artichokes — but not quite. YUM! I’ve got my mother-in-laws crepe recipe from her Manicotti recipe — I’m going to try this ASAP. Thanks Nancy! And yes, Patti, please send me your Italian Wedding Soup. Send it to the contact maria email on this home page. Ditch the dead animal balls and make mini organic seitan balls instead!! I expect more of Rodale. You can’t eat meat and be an environmentalist. Meat contributes more to climate change, water depletion, pesticide usage, fossil fuel usage and misuse of farmland, than many other sources. Thank you for sharing your opinion. Of course I only recommend eating organic, humanely raised, environmentally correct meat raised without hormones and antibiotics. In fact, proper organic meat production can help the environment, not hurt it. However, I respect the choice many people make to eat vegetarian, and just urge you to make sure that your seitan is organic, otherwise you are eating GMO’s which TRULY are destroying the environment. I would love a Manacotti Recipe. Have never made it, but I love Italian. dear James, search my site for my mother in law’s Manicotti from Heaven recipe…it’s divine. hustle dance video activation yuo tube david geddes youtube addicting video games.